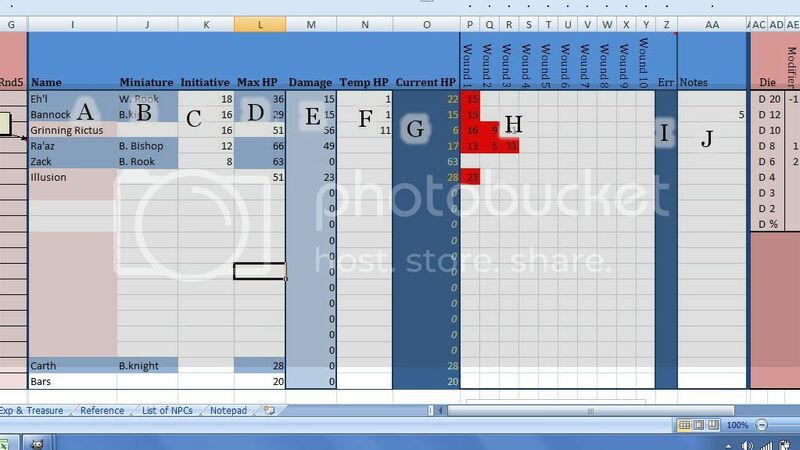 You can download this Excel combat manager right here. You need Microsoft Excel 2007 to use these files. OpenOffice may open this file okay, but I have not tried it. When I first started to use a laptop to run a game, my first concern was how to handle initiative. I used a simple matrix when I was running the game with paper, but there was not an easy way to reproduce the matrix with just a word processor. It took me a surprising amount of time to realize that Excel was my best option. Once I started using Excel to run my initiative matrix, its other features were easy to pick up. Using comments in the matrix is a good way to note the duration of ongoing effects. If they are obtrusive, right clicking the cell they're in and selecting "hide comment" will tuck them away until you hold your courser over that cell. The lion's share of the worksheet is a little more complex. I will go through each section in turn. I do not have any programming experience, and I do not consider this professional caliber, but I am proud of it nonetheless. A) PC and NPC Names: These are, of course, the names of the characters who are involved in the combat. These can be sorted by initiative. The first thing you need to do when starting a new fight is to populate the combatants. PC names are auto-populated and highlighted in blue. To change their names, change their information on the PC notes page. Other characters need to be named manually. B) Miniatures: I like to use a battlemap in my games. I have this column here to note which figure is who. I usually use chess pieces for PCs and other major characters, and poker chips labeled with numbers for all the non-essential actors. If you do not use miniatures, you can delete this column in entirely. C) Initiative: This is the heart and soul of this little project. To use it, roll initiative the way you normally would, and log the rolls in this column by noting them the character's corresponding row. When you have each character's initiative, right click the initiative column and select "sort largest to smallest". The characters wounds, notes, and relevant information will be resorted to reflect that characters position in the initiative. This function makes it easy for the GM when characters want to delay and change their spot in initiative or when characters enter the middle of a battle. If two characters roll the same initiative, you can add .5 to the initiative of the character with a higher dexterity score to bump him above his foe, otherwise they are sorted alphabetically by name. D) Max HP: This is exactly what it sounds like. For PCs, their Max HP is auto-populated from the PC notes worksheet. To change this value, switch over to that worksheet (by using the tabs at the bottom of the sheet) and enter their new HP total. For other characters like NPCs or monsters, you need to adjust this value manually. Simply write in their HP. This is the second step for populating the worksheet for an encounter. E) Damage: This is the sum of hit points the character has lost. It auto-populates, and you should never have to adjust the value here. It merely sums the values in the wounds columns and tells you how much damage this character has suffered. F) Temp HP: When a character is under an effect that awards temporary HP, write it in here. The Temp HP function here is not perfect because it works like hit points granted because of constitution boosts. The equation for current HP is (Max XP - Damage + Temporary HP), so, when you delete the Temporary HP value the hit points for that character "drop out of the bottom", and reduce that character's current hit points by that amount. To adjust this to reflect how temporary hit points work, you will have to adjust the character's "wounds" by the same amount of temp hit points you are removing. G) Current HP: This field is highlighted because it is probably the most important. It displays the current hit points of the character in that row. This field auto-populates by subtracting Damage from Max HP and adding Temp HP, so you should never need to write anything in this field. When the character is near death, this field is highlighted red. H) Wounds: These 10 columns corresponds to wounds which resulted in a character losing hit points. When a character is hurt, write the amount of hit points he lost as a whole in one of the wound columns. These are summed in the Damage column. These "wounds" are highlighted red. Healing can also be represented by writing a wound as a negative number. These "negative wounds" are highlighted green. Sometimes, especially for longer fights, you need to add several wounds together to create more room to work, and it is helpful to have that visual cue. I) Err: The way I wrote the wound tracker means that it is possible for you to add more "negative wounds" or heal a character above his max hit points. When this happens, an error will occur. 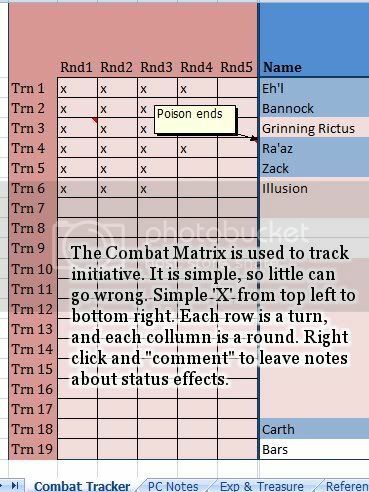 The error will come up in the column, directing you to the row the error is in and by how much you have gone over the characters maximum hit points. Simply adjust the "negative wound" value by the value that has come up in the err column. It is not elegant, but it is a solution. J) Notes: A small place to write little reminders that this character is under a status effect, invisible, etc. This looks amazing and I would like to try it... how do you download? The link is dead. I updated the link, so you should be able to download the file now. Yeah. Your link died, and now i cannot download it. I updated the link, so you should be able to download it now. This looks really awesome! Can't wait to use it in my campaigns!